Picard Of The Pops: Picard's Flute | Warped Factor - Words in the Key of Geek. Chris Morley picks up the flute. Having devoted much attention to one James T Kirk, time now to look to his successor Jean Luc Picard, & his flute! Forming a duo with Nella Daren, they perform the Inner Light theme, or at least a variation on it. Having studied music at university in West Virginia, Chattaway would be conscripted into the US Navy, building on his initial experience as part of a rhythm & blues band known as the Abductors by joining the Navy Band serving as chief composer/arranger. Following discharge it was time to move on to the Maynard Ferguson Orchestra, in which he again composed & arranged songs such as Superbone Meets The Bad Man & Primal Scream. 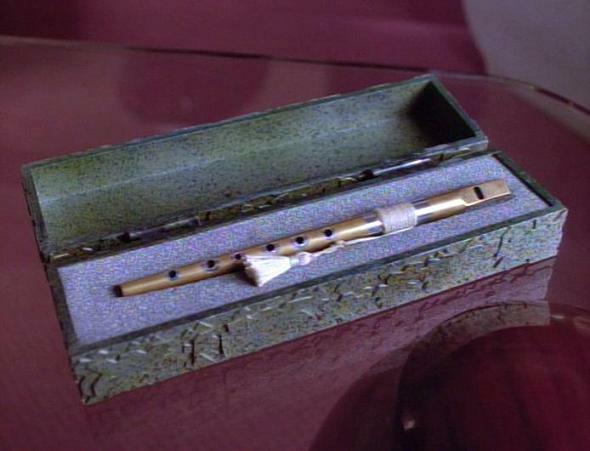 The Ressikan flute Chattaway wrote for becomes a memento for its player following an alien probe which causes Picard to experience life as Kamin, a scientist. The probe itself was designed to keep alive the memory of his humanoid race long after their extinction, their planet's sun going nova. As well as being handy in matters of science, Kamin mastered the aforementioned wind instrument presumably as a means of just showing off! Chattaway's contribution to the flute's mythos is actually a rearrangement of part of Max Bruch's Scottish Fantasy. "Despite the fact that Bruch was a virtual stranger to Scotland at the time he wrote his Scottish Fantasy, there is nothing to suggest that the work is based on anything other than wholly authentic Scottish melodies. Its opening movement uses ‘Auld Rob Morris’; from there, we move on to ‘Dusty Miller’, before ‘I’m down for lack of Johnnie’ in the third movement and, to conclude, the ebullient ‘Scots Wha Hae’ in the finale." Following its introduction the flute remains at the Captain's side for the remainder of the Next Generation series, glimpsed in its handy box on his desk when not at his lips. Its best known appearance is probably as part of the above mentioned duet with Daren in Lessons - a shared passion for music leading to a sort of romance between he & the stellar cartographer. She, of course, brings her handily portable piano into proceedings! There was time to practice a little Mozart in A Fistful Of Datas into the bargain. The piece we hear him attempting to master while playing along to an original recording is the Divertimento, before he's interrupted & the file becomes corrupted, overwritten with part of Dvorak's Slavonic Dance No. 8. 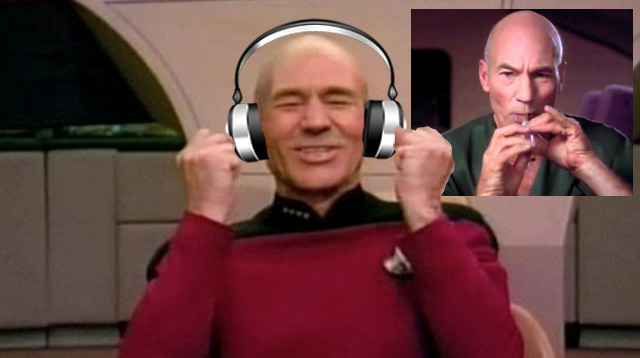 And so the Picard Mozart Trio is left up in smoke. "Brice is an active studio musician, and plays for film, TV, and commercial soundtracks. He specialized in exotic woodwinds, and has a large collection from around the world. He has played for “Robin Hood: Prince of Thieves,” the Grammy Awards Orchestra, “Star Trek: Voyager,” and “The Wonderful World of Disney.” Brice is also a composer and has written music for concerts, film, and television." Morgan Gendel, the episode's writer, would dig up The Inner Light as part of a retrospective for www.startrek.com, revealing that the flute was close to being cut! "Nowhere was the extent of my own journey more evident than in the creation of The Flute. I don’t remember who in the room literally laughed at my suggestion but I recall it being greeted with the same enthusiasm as if I had said Picard would start visiting the bridge in a muumuu. I also don’t remember how impassioned my plea was, but I must have made a good closing argument because on my very next visit Michael Piller said he had reconsidered. I often wonder if Jay Chattaway’s superb “Inner Light Theme” ever came to the attention of George Harrison, who wrote the little-known Beatles song for which I named the episode. The lyrics are so apt." Indeed Jean Luc & George go on similar journeys. Harrison had of course earlier dabbled in similar Indian spirituality/instrumentation on the likes of Norwegian Wood, Love You To & Within You Without You following lessons with Ravi Shankar. In Picard's case life really did go on within & without him!